On this web page I'll discuss how to build a solar system model.You may have found this page because you need to build a solar system school project. Others might want to create strange lizard-landscapes -that are primarily intended for smaller lizards such as leopard geckos or spiders such as tarantulas. 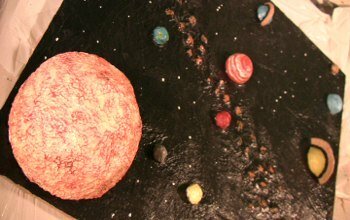 This solar system project is created with the same techniques that all of the other projects on this web site are created with. That is to say, they are created with safety in mind -with the final product being nontoxic. So having said that, if you are creating this solar system for kids or for a pet lizard the end result is a nontoxic solar system model. One of the best things you can do is look at pictures of the solar system. When you're trying to build a solar system model you should have references from which to look at. Solar system pics can be found on NASA's web site. Some facts about the solar system you'll want to include: the map of the solar system -meaning the order in which the planets are aligned.This is especially important if you are creating a solar system school project. When creating a solar system for kids usually a teacher will want various "extras" such as an asteroid belt a comet and possibly some constellations such as the big dipper. This project is essentially a styrofoam solar system project. You could make your system out of any materials you like, I just happen to use Styrofoam, grout, various paints and a nontoxic sealant as a last step. The first step I take towards my formation of the solar system is plan how big I want the project to be. If you're creating this for a pet lizard you want to make sure the final product can fit into a lizard cage. If you are creating this for a solar system school project you should know how big or small your solar system model needs to be. After you've looked at many pictures of the solar system you'll need to decide what type of materials you want to use. First, I constructed my base platform into a rectangle that would end up holding all of the solar system planets. I used Styrofoam panels that I got from a hardware store. I went to a store such as michaels arts and crafts and bought a bag of small Styrofoam balls to represent some of the planets. 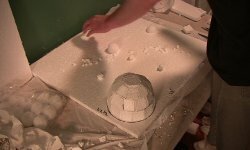 I constructed the sun from Styrofoam in an igloo type design; what I would recommend is finding an arts and crafts store that sells large "half ball" sections of Styrofoam. All of this is much more understandable if you watch the video above on how to build a solar system model. I left the sun unglued to give the option of attaching it with Velcro. The planets, I went ahead and glued into position according to the solar system diagram -as to what order the planets are in starting from closest to the sun. From looking at some pictures of the solar system you'll want to "size" the planets accordingly. The sun is obviously the largest with Jupiter being the largest planet followed by Saturn (you get the idea). I also included the asteroid belt that occurs just after Mars and before Jupiter. I put in a black hole just for fun even though our solar system obviously does not have a black hole (or else we might be sucked into it). After gluing everything into place -except for the sun I preceded to apply at least two layers of grout to the entire solar system project. The grout is an unnecessary stage unless you're trying to build a solar system model for a pet lizard. The grout strengthens the structure, plus in the case of the sun it enabled me to increase the texture of the sun which improved the overall look of the solar system model. If you're just creating this for a solar system school project then you can skip the grouting stage and move on to the painting stage. And yet, the grouting stage will improve the overall look of your model. If you're using this for a solar system for kids in elementary school then you might not have time for the grouting stage. New facts about the solar system conclude that Pluto is no longer considered to be a planet. It always was when I was a kid, but you'll have to make up your own mind as to whether not you want to include it in your map of the solar system. For the painting process concerning the choice of colors you need to research the NASA web site for good reference pictures to look at to determine the color and design of the solar system planets. As a last stage I like to apply four layers of a nontoxic sealant such as mod podge. This will strengthen the solar system project and if you're making this for a pet lizard or tarantula it will make the structure safe to "live on". Again, if this is to be a solar system school project then sealing it is not really necessary although it will definitely make the project last longer. In your attempt to make your own solar system model be sure to check out other sources to give you a variety of inspiration. If you're creating this Styrofoam solar system for a pet lizard or tarantula you might think about a slightly different idea or structure that could fit into a much smaller cage. An idea might be to just create constellations or perhaps a different galaxy than ours. So whether you are building this for a small reptile or if this is a solar system for kids, be sure to watch the video above detailing how to build a solar system model. 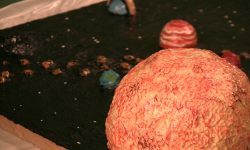 Have A Great Story About a Solar System Model?